The use, sale, and possession of cannabis over 0.3% THC in the United States is illegal under federal law. As a Schedule I drug under the federal Controlled Substances Act of 1970, cannabis over 0.3% THC (legal term marijuana) is considered to have “no accepted medical use” and have a high potential for abuse and physical or psychological dependence. Cannabis use is illegal for any reason, with the exception of FDA-approved research programs. However, individual states have enacted legislation permitting exemptions for various uses, mainly for medical and industrial use but also including recreational use. Cannabis for industrial uses (hemp) was made illegal to grow without a permit under the Controlled Substances Act because of its relation to cannabis as a drug, and any imported products must adhere to a zero tolerance policy. The Agricultural Act of 2014 allows for universities and state-level departments of agriculture to cultivate cannabis for research into its industrial potential. As a psychoactive drug, cannabis continues to find extensive favor among recreational and medical users in the United States. As of 2019, ten states, the District of Columbia, and the Northern Mariana Islands have legalized recreational use of cannabis, while 33 states, Guam, Puerto Rico, the U.S. Virgin Islands and D.C. have legalized medical use of the drug. Multiple efforts to reschedule cannabis under the Controlled Substances Act have failed, and the United States Supreme Court has ruled in United States v. Oakland Cannabis Buyers’ Cooperative (2001) and Gonzales v. Raich (2005) that the federal government has a right to regulate and criminalize cannabis, whether medical or recreational. 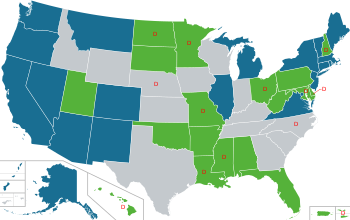 As a result, cannabis dispensaries are licensed by each state; these businesses sell cannabis products that have not been approved by the U.S. Food and Drug Administration, nor are they legally registered with the federal government to sell controlled substances. Although cannabis has not been approved, the FDA recognizes the potential benefits and has approved two drugs that contain components of marijuana. The ability of states to implement cannabis legalization policies was weakened after US Attorney General Jeff Sessions rescinded the Cole Memorandum on January 4, 2018 and issued a new memo instructing US Attorneys to enforce federal law related to marijuana. The Cole memo, issued by former Deputy Attorney General James Cole in 2013, urged federal prosecutors to refrain from targeting state-legal marijuana operations. Regarding the medical use of cannabis, the Rohrabacher–Farr amendment still remains in effect to protect state-legal medical cannabis activities from enforcement of federal law. 5.1 History of cannabis political parties in the U.S.
Roger Roffman, a professor of social work at the University of Washington, asserted in July 2013 that “approximately 3.6 million Americans are daily or near daily users.” Peter Reuter, a professor at the School of Public Policy and the Department of Criminology at the University of Maryland, College Park, said that “experimenting with marijuana has long been a normal part of growing up in the U.S.; about half of the population born since 1960 has tried the drug by age 21.” A World Health Organization survey found that the United States is the world’s leading per capita marijuana consumer. The 2007 National Survey on Drug Use & Health prepared by the U.S. Department of Health and Human Services indicated that 14.4 million U.S. citizens over the age of 12 had used marijuana within a month. The 2008 survey found that 35 million Americans were willing to tell government representatives that they had used marijuana in the past year. Medical use is a common reason why people use marijuana. According to the National Institute on Drug Abuse, “The term medical marijuana refers to using the whole unprocessed marijuana plant or its basic extracts to treat a disease or symptom.” However, the U.S Food and Drug Administration (FDA) has not officially approved marijuana as a medicine. Until the passage of the 2018 United States farm bill, under federal law, it was illegal to possess, use, buy, sell, or cultivate cannabis in all United States jurisdictions, since the Controlled Substances Act of 1970 classified marijuana as a Schedule I drug, claiming it has a high potential for abuse and has no acceptable medical use. Despite this federal prohibition, some state and local governments established laws attempting to decriminalize cannabis, which has reduced the number of “simple possession” offenders sent to jail, since federal enforcement agents rarely target individuals directly for such relatively minor offenses. Other state and local governments ask law enforcement agencies to limit enforcement of drug laws with respect to cannabis. However, under the Supremacy Clause of the United States Constitution, federal law preempts conflicting state and local laws. In most cases, the absence of a state law does not present a preemption conflict with a federal law. The federal government criminalized marijuana under the Interstate Commerce Clause, and the application of these laws to intrastate commerce were addressed squarely by the United States Supreme Court in Gonzales v. Raich, 352 F. 3d 1222 in 2005. In January 2009, President Barack Obama‘s transition team organized a poll to clarify some of the top issues the American public wants to have his administration look into, and two of the top ten ideas were to legalize the use of cannabis. In July 2009, Gil Kerlikowske, Director of the Office of National Drug Control Policy, clarified the federal government’s position when he stated that “marijuana is dangerous and has no medicinal benefit” and that “legalization is not in the president’s vocabulary, and it’s not in mine.” However, a January 2010 settlement between the U.S. Drug Enforcement Administration and the Wo/Men’s Alliance for Medical Marijuana (WAMM) provided an example confirming the administration policy as communicated by Attorney General Eric Holder, as WAMM reached an agreement that allowed them to re-open after being shut down by the federal government in 2002. Following the 2012 presidential election, the Office of National Drug Control Policy under the Obama administration stated that it “steadfastly opposes legalization of marijuana and other drugs because legalization would increase the availability and use of illicit drugs, and pose significant health and safety risks”. In February 2014, the administration issued guidelines to banks for conducting transactions with legal marijuana sellers so these new businesses can stash away savings, make payroll, and pay taxes like any other enterprise. However, marijuana businesses still lack access to banks and credit unions due to Federal Reserve regulations. On August 29, 2013, the Justice Department adopted a new policy (known as the Cole memo) regarding the enforcement of federal law in states that have legalized non-medical cannabis. The policy specified that commercial distribution of cannabis would be generally tolerated, except in certain circumstances, such as if violence or firearms are involved, the proceeds go to gangs and cartels, or if the cannabis is distributed to states where it is illegal. On December 11, 2014, the Department of Justice told U.S. attorneys to allow Native American tribes on reservations to grow and sell marijuana, even in states where it is illegal. The policy will be implemented on a case-by-case basis and tribes must still follow federal guidelines. On May 30, 2014, the United States House of Representatives passed the Rohrabacher–Farr amendment, prohibiting the Justice Department from spending funds to interfere with the implementation of state medical marijuana laws. The amendment became law in December 2014, and must be renewed each year in order to remain in effect. On March 10, 2015, U.S. Senators Rand Paul, Kirsten Gillibrand, and Cory Booker introduced the Compassionate Access, Research Expansion and Respect States Act or CARERS Act. The bipartisan bill would move cannabis from Schedule I to Schedule II of the Controlled Substances Act. This would allow states with medical cannabis laws to legally prescribe it, and allow for much easier research into its medical efficacy. The bill would also allow grow sites besides the University of Mississippi, which has long been the sole supplier of cannabis for academic research, to supply cannabis for study. The Food and Drug Administration has approved two synthetic cannabis drugs for treating cancer and other medical issues. The federal government of the United States continues to argue that smoked cannabis has no recognized medical purpose (pointing to a definition of “medical purpose” published by the DEA, not the Food and Drug Administration, the National Institutes of Health, the Centers for Disease Control, or the office of the U.S. Surgeon General and the U.S. Public Health Service). Many officials point to the difficulty of regulating dosage of cannabis (a problem for treatment as well as research), despite the availability (in Canada and the United Kingdom) of dosage-controlled Sativex. The United States has also pressured other governments (especially Canada and Mexico, with which it shares borders) to retain restrictions on marijuana. On January 4, 2018, the Cole memo was rescinded by Attorney General Jeff Sessions, restoring the ability of US Attorneys to enforce federal law in states that have legalized non-medical cannabis. On December 20, 2018, President Donald Trump signed the farm bill which descheduled hemp, making cannabis under 0.3% THC legal once again. In 1973 Oregon became the first state to decriminalize cannabis, and in 2012 Colorado and Washington became the first states to legalize recreational use. As of November 2018, ten states (Alaska, California, Colorado, Maine, Massachusetts, Michigan, Nevada, Oregon, Vermont, and Washington), the District of Columbia, and the Northern Mariana Islands have legalized the recreational use of cannabis, with all but Vermont and D.C. permitting its commercial sale. Another 13 states (plus the U.S. Virgin Islands) are considered to have decriminalized cannabis. In 1996, California became the first state to legalize the medical use of cannabis when voters approved Proposition 215. As of January 2019, thirty-three states plus the District of Columbia, Guam, Puerto Rico, the Northern Mariana Islands, and the U.S. Virgin Islands have legalized medical cannabis. Fourteen other states have more restrictive laws limiting THC content, for the purpose of allowing access to products that are rich in cannabidiol (CBD), a non-psychoactive component of cannabis. The National Center for Natural Products Research in Oxford, Mississippi is the only facility in the United States that is federally licensed by the Drug Enforcement Administration to cultivate cannabis for scientific research. The facility is part of the School of Pharmacy at the University of Mississippi, and cultivates cannabis through a contract with the National Institute on Drug Abuse, to which it provides the cannabis. The federal government has so far refused to grant any other licenses for the cultivation of cannabis, which has had a hindering effect on the amount of research conducted. The cannabis supplied by NIDA has been criticized by researchers for a variety of reasons, including high amounts of stems and seeds, high mold and yeast levels, low THC content, and low diversity of strains available. NIDA has also been criticized for the length of time in which it responds to proposals, and for favoring research on the harms caused by cannabis over research on the health benefits of cannabis. In August 2016, the DEA announced intention to grant additional cultivation licenses, but as of July 2017, 25 applications had been submitted to the DEA and none had been approved, with no timeline given by the DEA for the approval of any licenses. Research conducted on cannabis also requires licensing from the DEA (specific to Schedule I drugs), and approval from the FDA as well. Prior to 2015, research also required approval from the U.S. Public Health Service, but this requirement was eliminated to make it less difficult for cannabis research to be approved. Numerous medical organizations in the U.S. have called for restrictions on cannabis research to be further eased, including the American Academy of Family Physicians, American Psychological Association, American Cancer Society, American Academy of Pediatrics, and the American Nurses Association. The great majority of cannabis arrests are for possession. However, in 1997, the vast majority of inmates in state prisons for marijuana-related convictions were convicted of offenses other than simple possession. According to the Federal Bureau of Investigation’s annual Uniform Crime Report, there have been over twelve million cannabis arrests in the United States since 1996, including 749,825 persons for marijuana violations in 2012. Of those charged with marijuana violations in 2012, 658,231 (88%) were charged with possession only. The remaining 91,593 individuals were charged with “sale/manufacture”, a category that does not differentiate for cultivation offenses, even those where the marijuana was being grown for personal or medical use. Marijuana arrests comprise almost one-half (48.3 percent) of all drug arrests reported in the United States. According to the American Civil Liberties Union, there were 8.2 million marijuana arrests from 2001 to 2010, and 88% of those arrests were just for having marijuana with them. The Libertarian Party and the Green Party are known for advocating for the legalization of marijuana. There are also active cannabis political parties in at least five states. These include the Grassroots-Legalize Cannabis Party, the Legal Marijuana Now Party, the Legalize Marijuana Party, and the United States Marijuana Party. History of cannabis political parties in the U.S. The United States Marijuana Party is an organization that promotes electoral involvement by marijuana legalization supporters. In 2012, the group endorsed Libertarian Gary Johnson for President. In July 2016, delegates at the 2016 Democratic National Convention voted to approve a party platform calling for cannabis to be removed from the list of Schedule I substances, as well as calling for a “reasoned pathway for future legalization”. Gallup began polling the public as to the issue of legalizing cannabis in 1969; in that year 12% were in favor. The 2017 Gallup poll showed a record high of 64% in favor of legalizing cannabis, including a majority of Republicans for the first time. According to a 2013 survey by Pew Research Center, a majority of Americans favored complete or partial legalization of cannabis. The survey showed 52% of respondents support cannabis legalization and 45% do not. College graduates’ support increased from 39% to 52% in just three years, the support of self-identified conservative Republicans (a group not traditionally supportive of cannabis legalization) had increased to nearly 30%, and bipartisan support had increased across the board. The 2018 version of the poll showed public support had increased to 61%. Attitudes regarding marijuana regulation changed as some states (Colorado, Washington, Oregon, Maine, and Alaska) passed their own laws legalizing marijuana for recreational use. According to a Gallup Poll published in December 2012, 64% of Americans believe the federal government should not intervene in these states. ^ Data table: Total Number of Arrests in the US by Year and Type of Offense. Drug War Facts. ^ Drugs and Crime Facts: Drug law violations and enforcement. From the United States Bureau of Justice Statistics (BJS). Source: FBI Uniform Crime Reports. Click on the charts to view the data. ^ Marijuana Research: Uniform Crime Reports – Marijuana Arrest Statistics. Has data table for earlier years. Source: FBI Uniform Crime Reports. ^ Clarke, Robert; Merlin, Mark (2013). Cannabis: Evolution and Ethnobotany. University of California Press. p. 185. ISBN 978-0-520-95457-1. ^ DEA (2013). “The DEA Position on Marijuana” (PDF). Dea.gov. Retrieved May 15, 2016. ^ McKinsey, John A.; Burke, Debra (2014). Carper’s Understanding the Law. Cengage Learning. p. 216. ISBN 978-1-305-17730-7. ^ “State Industrial Hemp Statutes”. National Conference of State Legislatures. April 18, 2018. Retrieved July 5, 2018. ^ a b c “State Medical Marijuana Laws”. National Conference of State Legislatures. June 27, 2018. Retrieved July 5, 2018. ^ White, Rob (2013). Global Environmental Harm: Criminological Perspectives. University of Tasmania. p. 185. ISBN 978-1-134-03031-6. ^ Jonathan P. Caulkins; Beau Kilmer; Mark A.R. Kleiman (2016). Marijuana Legalization: What Everyone Needs to Know?. Oxford University Press. p. 25. ISBN 978-0-19-026243-3. ^ Lowinson, Joyce H. (2005). Substance Abuse: A Comprehensive Textbook. Lippincott Williams & Wilkins. p. 274. ISBN 978-0-7817-3474-5. ^ “Recreational Cannabis in US”. Retrieved May 5, 2016. ^ David Neubauer; Stephen Meinhold (2013). Judicial Process: Law, Courts, and Politics in the United States. Cengage Learning. p. 108. ISBN 978-1-133-71178-0. ^ “Public Health Focus > FDA and Marijuana: Questions and Answers”. Fda.gov. Retrieved May 15, 2016. ^ Brian F Thomas; Mahmoud ElSohly (2015). The Analytical Chemistry of Cannabis: Quality Assessment, Assurance, and Regulation of Medicinal Marijuana and Cannabinoid Preparations. Elsevier Science. p. 83. ISBN 978-0-12-804670-8. ^ Commissioner, Office of the. “Public Health Focus – FDA and Marijuana”. www.FDA.gov. Retrieved November 23, 2016. ^ Zapotosky, Matt; Horwitz, Sari; Achenbach, Joel (January 4, 2018). “Use of legalized marijuana threatened as Sessions rescinds Obama-era directive that eased federal enforcement”. Retrieved January 6, 2018 – via www.WashingtonPost.com. ^ Reilly, Ryan J.; Wing, Nick (January 4, 2018). “Jeff Sessions Unleashes Federal Prosecutors On Legal Marijuana”. Retrieved January 6, 2018 – via Huff Post. ^ Degenhardt, L; Chiu W-T, Sampson N; Kessler, RC; Anthony, JC; et al. (2008). “Toward a Global View of Alcohol, Tobacco, Cannabis, and Cocaine Use: Findings from the WHO World Mental Health Surveys”. PLoS Med. 5 (7): e141. doi:10.1371/journal.pmed.0050141. ^ “Results from the 2007 National Survey on Drug Use and Health: National Findings”. U.S. Department of Human Health and Services. 2007. Retrieved March 28, 2013. ^ a b SAMHSA, Office of Applied Studies. “2008 Tables: Illicit Drug Use – 1.1 to 1.46 (PE), SAMHSA OAS”. Oas.samhsa.gov. Archived from the original on September 4, 2010. Retrieved September 15, 2010. ^ NORML / By Paul Armentano (September 10, 2009). “Over 100 Million Americans Have Smoked Marijuana – And It’s Still Illegal? | Drugs”. AlterNet. Retrieved September 15, 2010. ^ Table 1.1B – Types of Illicit Drug Use in Lifetime, Past Year, and Past Month among Persons Aged 12 or Older: Percentages, 2010 and 2011? ^ “Marijuana as Medicine”. National Institute on Drug Abuse. ^ “- Retrieved 20 January 2009”. Archived from the original on January 20, 2009. ^ “Kerlikowske: Legal pot ‘not in my vocabulary‘“. KOMO News. August 7, 2009. Retrieved July 21, 2016. ^ “Santa Cruz medical pot collective settles lawsuit with feds – San Jose Mercury News”. Mercurynews.com. Retrieved September 15, 2010. ^ “Santa Cruz medical pot collective settles lawsuit with feds”. Inside Bay Area. Retrieved September 15, 2010. ^ “Marijuana Resource Center”. Office of National Drug Control Policy. ^ “Feds Let Banks and Marijuana Sellers Do Business”. Archived from the original on February 14, 2014. ^ “The Marijuana Industry’s Access to Banks”. ^ Rough, Lisa (September 14, 2017). “The Cole Memo: What Is It and What Does It Mean?”. Leafly. Retrieved January 11, 2018. ^ Phelps, Timothy M. “U.S. won’t stop Native Americans from growing, selling pot on their lands”. Los Angeles Times. Retrieved December 12, 2014. ^ Sullum, Jacob (January 4, 2016). “The Federal Ban on Medical Marijuana Was Not Lifted”. Reason. Retrieved February 7, 2017. ^ Kroll, David. “Senators Introduce Bill To End Federal Curbs On Medical Marijuana”. Forbes. Retrieved March 12, 2015. ^ Commissioner, Office of the. “Public Health Focus – FDA and Marijuana”. www.fda.gov. ^ Savage, Charlie; Healy, Jack (January 6, 2018). “Trump Administration Takes Step That Could Threaten Marijuana Legalization Movement”. Retrieved January 6, 2018 – via NYTimes.com. ^ a b “Milestones in U.S. Marijuana Laws”. The New York Times. Retrieved July 5, 2018. ^ a b “Marijuana Overview”. National Conference of State Legislatures. Retrieved July 5, 2018. ^ Angell, Tom. “Michigan Voters Approve Marijuana Legalization”. Forbes. Forbes Media LLC. Retrieved 6 November 2018. ^ Gardner, Fred (December 18, 2014). “DEA Upholds Grower’s Marijuana Monopoly”. CounterPunch. Retrieved January 11, 2018. ^ Hellerman, Caleb (March 8, 2017). “Scientists say the government’s only pot farm has moldy samples — and no federal testing standards”. PBS. Retrieved January 11, 2018. ^ Hudak, John (August 11, 2016). “The DEA’s marijuana decision is more important than rescheduling”. The Brookings Institution. Retrieved January 11, 2018. ^ Staggs, Brooke Edwards (July 2, 2017). “DEA hasn’t loosened marijuana cultivation monopoly while applications from researchers mount”. The Cannifornian. Retrieved January 11, 2018. ^ Zielinski, Alex (August 17, 2016). “The DEA Hasn’t Made Marijuana Research Any Easier”. ThinkProgress. Retrieved January 11, 2018. ^ Nelson, Steven (June 22, 2015). “Major Pot Research Barrier Goes Up in Smoke”. U.S. News & World Report. Retrieved January 11, 2018. ^ “Marijuana — AAFP Policies”. aafp.org. Retrieved January 11, 2018. ^ “Marijuana research: Overcoming the barriers”. American Psychological Association. September 14, 2017. Retrieved January 11, 2018. ^ “Marijuana and Cancer”. American Cancer Society. Retrieved January 11, 2018. ^ “Drugs and Crime Facts”. United States Bureau of Justice Statistics (BJS). Retrieved May 8, 2018. .
^ “Marijuana”. Drug War Facts. Retrieved September 15, 2010. ^ “Drug Crimes in the U.S.” Fbi.gov. ^ “Marijuana Arrests by the Numbers”. American Civil Liberties Union. ^ Hanson, Alex (August 25, 2016). “Weekly politics wrap-up: Ballot access in Iowa”. Iowa State Daily. ^ Stassen-Berger, Rachel E. (August 24, 2016). “Don’t like Trump or Clinton? You have choices”. Pioneer Press. ^ Hotakainen, Rob (July 26, 2016). “Democrats become first major party to back pathway to legalizing pot”. McClatchy. Retrieved January 11, 2018. ^ Smith, Michael. “Support for Legal Marijuana Use Up to 60% in U.S.” Gallup. Retrieved November 20, 2016. ^ Ingraham, Christopher (October 25, 2017). “For the first time, a majority of Republicans support marijuana legalization”. The Washington Post. Retrieved January 11, 2018. ^ “Majority Now Supports Legalizing Marijuana”. Pew Research Center for the People and the Press. April 4, 2013. Retrieved November 9, 2015. ^ Geiger, Abigail (January 5, 2018). “About six-in-ten Americans support marijuana legalization”. Pew Research Center. Retrieved January 11, 2018. ^ “Americans Want Federal Gov’t Out of State Marijuana Laws”. Retrieved April 4, 2013. ^ Felson, Jacob; Adamczyk, Amy; Thomas, Christopher (2018). “How and why have attitudes about cannabis legalization changed so much?” (PDF). Social Science Research. doi:10.1016/j.ssresearch.2018.12.011. Retrieved 2018-12-21.